Posted September 29th, 2013 by Gerry La Rocca & filed under Accounting Careers, Canadian Economy, Corporate Restructuring, Financial Accounting, Managerial Accounting, Marketing & Strategy. 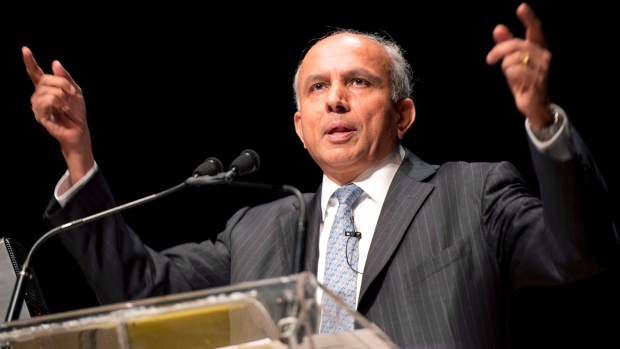 Fairfax Financial chairman and CEO Prem Watsa speaks at the company’s annual general meeting in Toronto in April 2013. A takeover is necessary to give battered BlackBerry the time it needs to get itself back in order, company watchers say. On Monday, BlackBerry said a consortium led by Fairfax Financial Holdings Ltd. had signed a letter of intent to buy the company for $9 US a share in a deal valued at $4.7 billion US. The news came just days after BlackBerry announced it would take a non-cash loss in the second quarter of $930 million to $960 million, mainly due to its large inventory of unsold devices. The company said at the time that it sold only 3.7 million smartphones in the second quarter, and was cutting 4,500 jobs. If the Fairfax bid is successful BlackBerry, which went public in 1997, would disappear from stock markets. But it would gain time to fix its business away from the public scrutiny that comes with quarterly results and coverage by analysts, and the media. “Taking it private [is] the only way to save anything,” said Iain Grant of technology research and strategy firm SeaBoard Group. “Otherwise just continue circling the drain — every quarter losses continue, confidence evaporates, no magic [equals] no value,” Grant said in an email to CBC News. Fairfax Financial, which is led by Prem Watsa, already owns about 10 per cent of BlackBerry. Watsa served on the BlackBerry board from January 2012 until August 2013, when he stepped down citing a potential conflict of interest. Ian Sprott, assistant professor at the Sprott School of Business, said he is leaning toward viewing this as a new beginning for BlackBerry. “If anybody can do it, I think they can,” he added. It’s not immediately clear what Fairfax might have in mind for the Waterloo, Ont.-based firm, including what parts of the business might be kept and what might be discarded. Misek said BlackBerry should focus on its services business. “Job number one is shut down as much of the handset business as possible. Refocus, retool on services. Make sure you’re the number one mobile device management provider, cloud provider for Android and iPhone and mobile devices globally,” he said. BlackBerry’s software, services, global secure network and related encryption technology, and its intellectual property stockpile are “highly desirable assets that could be worth more than the sum of their parts as long as they are retained as a cohesive unit,” he said. BlackBerry’s fortunes over the years have been well-documented. ​Started in 1984, Research in Motion, as the company was formerly called, launched its first BlackBerry device in 1999. By 2007, the same year Apple unveiled its iPhone, Research in Motion had 10 million customers, and a $67-billion market capitalization — the highest on the Toronto Stock Exchange. RIM’s share price topped out in 2008 at $149.90, but has been decimated since then. Misek says 2009 was the point when things went wrong for BlackBerry. “That was a grave mistake,” he said. At $9 US a share, the Fairfax-led group could buy BlackBerry at a significant discount even to last week’s share price. On Sept. 20, after BlackBerry issued its earnings warning, its share tumbled 16 per cent to $9.08. 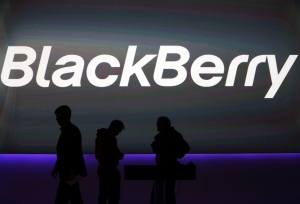 On Monday, BlackBerry shares were unchanged. The Fairfax consortium has six weeks to carry out its due diligence, during which time BlackBerry can solicit or negotiate other bids. Reaction on stock market to the takeover bid was tepid, perhaps suggesting the market doesn’t expect another bid to emerge. Some analysts have suggested Monday’s bid is the only way shareholders are going to get a solution to their problems. 1. Blackberry sold 3.7 million phones in three months, how many iphones 5’s were sold by Apple , during its one weekend launch!Click on link! 2. Why do you suppose Blackberry is losing money? 3. Do you agree that by taking the company Private, it will be saved? 4. What businesses should Blackberry concentrate on? Read more about Blackberry: Visit CBC News online.